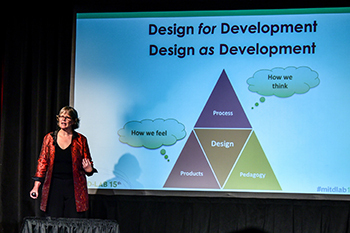 On October 20, MIT D-Lab hosted a full-day symposium at Little Kresge Theatre to celebrate its 15th anniversary. From its humble beginnings in 2002 as a class simply known as the “Haiti Class,” D-Lab has gone on to develop more than 20 MIT courses (more than a dozen are offered each year), six research groups, and a suite of global programs known as innovation practice, which consists of social entrepreneurship, innovation ecosystems, inclusive markets, and humanitarian innovation programs. The symposium kicked off with welcoming remarks from D-Lab Executive Director Bob Nanes, Vice Chancellor Ian Waitz, and D-Lab Founding Director Amy Smith, Over 30 students, alumni, fellows, researchers, faculty, instructors, staff, and global partners spoke about their work with D-Lab and the impact it has had on them personally and on their communities. Global partners who participated represented projects and programs in countries including Botswana, Colombia, Ghana, Guatemala, and Kenya. All of D-Lab’s research groups presented at the symposium with short talks on local innovation and development; off-grid energy decision-making tools; mobile tools for community health workers; technology-enabled methods for field research; creative capacity building; and “lean research” as developed by D-Lab and partners and practiced by the TEGA Girl Effect.